Ladies a Plate - Kapiti Playhouse Inc.
Kapiti Playhouse is proud to announce Ladies a Plate – a concert featuring Andrew London and Gilbert Haisman. The concert, which Kapiti Playhouse hopes to be the first in a series, will be held at the Kapiti Playhouse Theatre, 7 Ruahine Street, on Thursday 21st February at 8pm. Tickets are available now at Coastlands for just $25.00. With about 80 years’ performing experience between them, Andrew London and Gilbert Haisman offer a light-hearted retrospective look at New Zealand society ‘from the stage’. Humourous and gently satirical songs and stories that reflect our cultural mores, obsessions and taboos, from the point of view of two middle class, middle aged citizens of Middle Earth eking out a hand-to-mouth livelihood in what we like to call ‘the Entertainment Business’. If you’ve been to a function over the last 50 years (and who hasn’t?) , be it a dance in a country hall in 1965 to a swanky wedding at the Auckland viaduct in 2013, and wondered what the band were thinking – this is your chance to find out. Singer/songwriter Andrew London has performed his quirky and satirical original songs at Jazz and Arts Festivals all over New Zealand, and was flown, with his Hot Club Sandwich trio, to Riyadh in Saudi Arabia to perform at the NZ Embassy in 2010. His songs have featured on movie soundtracks, been nominated for Tui awards, gained a 4-star review in Downbeat USA, and featured on National Radio’s ‘Greatest Song Ever Written’ section. Visit http://andrewlondon.co.nz/ for more information about Andrew. 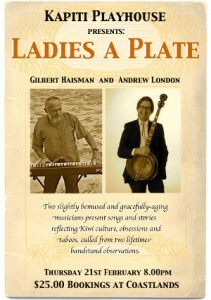 Gilbert Haisman is a jazz and silent movie pianist who has produced many shows, worked in arts education, led jazz groups, and performed in Wordsongs with singer-songwriter Val Murphy. His writing has been published in Landfall, Takahe, the School Journals and other periodicals.